I have released a slightly updated version of The Sidewalks of New York, with the most notable change being that the music volume has been lowered so that the narration is now front and center. This is currently only in this Vimeo version. It is not available on YouTube. Two other corrections include removing a reference to photographer Joseph Beal, since the name is supposed to be Joshua Beal, and also a small text change on the last title of the film. Other than lowered music and the two changes just mentioned, everything else remains as it was. The new version may go up on YouTube in the future. Today is a good time to revisit a line from a 1928 speech by the great Al Smith (1873-1944). Smith, known as "a man for the people", was denied the presidency (most notably in 1928) by an uneducated electorate that chose to believe fear-driven propaganda. The famous artist Norman Rockwell painted 'Al Smith was fellowman to every man' after Smith's death in 1945. In the painting, Smith is surrounded by children representing diverse backgrounds. 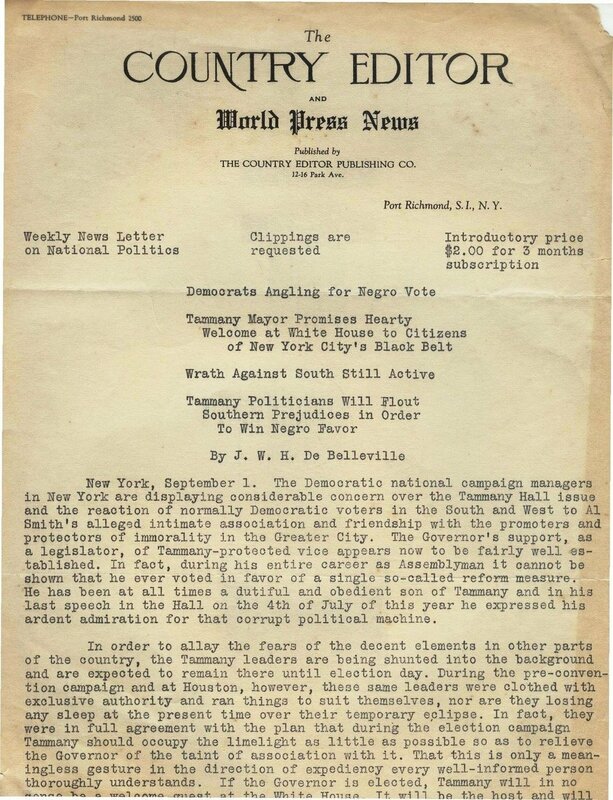 The images below show an article from 1928 that was published to an unknown number of voters. If you've seen my film The Sidewalks of New York, you know that the tactic of fear was used to scare people from voting for Al Smith in the 1928 presidential election. They denied him the presidency, despite history showing us today that he had the qualities and experience of someone who truly could have been one of our greatest presidents, even with the inevitable 1929 stock market crash. To bluntly summarize, the 1928 article wrongly acts like black people are scary and not to be trusted, and that they regularly offer insults to white women on street corners in Harlem. It also says that if Smith is voted in, the White House will be sure to cater to the needs of African Americans. Just like The Country Editor and World Press News existed in 1928 to push out propaganda, there are today "news" outlets on the internet that publish misleading stories. People in 1928 passed around the articles by hand. Today people click 'Share'. Unfortunately, just as people 89 years ago blindly believed what they read without making any attempts to check any available sources, today many people continue to do the same, despite there being a greater abundance of information, and despite all the years of education and life experience. Add on top of that the fact that most American homes have been using the internet in their homes for around 20 years, yet they still don't seem to know how to use it to properly gather facts, data, and sources. I believe that this comes not only from bigotry and hatred, but also it comes from a need for people to feel correct about the votes they've cast, and the parties they've chosen to support. Very often the people experiencing this are in denial that they are the problem, again because of the need to feel correct. They're stuck. They choose parties like it's the same as sports, even though the only true team is the party of "What's Best For The Country?". The past holds lessons that can help us in the present. I hope that one day the world can understand this simple idea. Almost 3,900 hours have passed since the September release of my free history documentary, The Sidewalks of New York. It only takes one hour to watch. Kick back tonight and experience the greatest story in New York history. 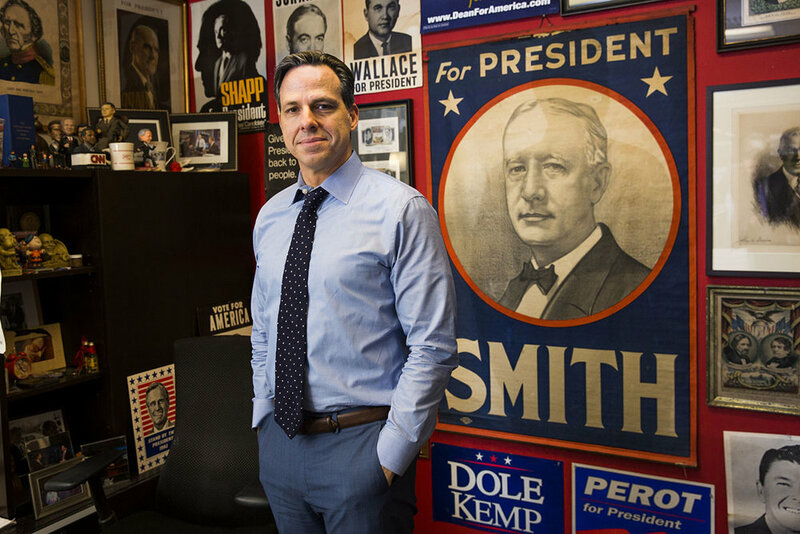 If ever anyone needed wonders if I exaggerated with my documentary the magnitude of Al Smith's life and political career when compared to the history of the United States, CNN anchor Jake Tapper's office might be a good place to look. The largest poster in his office from several angles appears to be one for Smith. If you believe that CNN is "fake news" and that Tapper doesn't have credibility, I challenge that and tell you that anyone who understands the importance of Smith also understands and believes in his message. Smith was "a man for the people".